The Wendat are an Iroquoian-speaking people. The Iroquoian peoples occupied the lower Great Lakes region and other areas in the southeast United States. 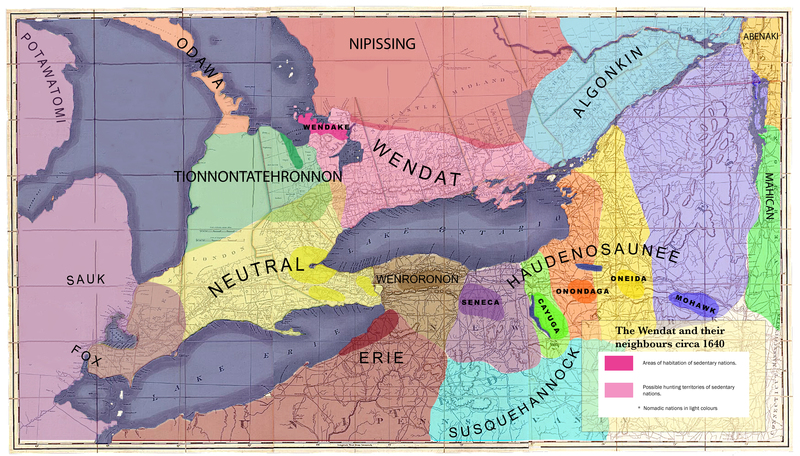 The language group includes, along with the languages of Wendake: the Tionontatehronnon, Neutral, Erie, Wenroronnon, Susquehannock, Cherokee and the languages of the Five Nations. Iroquoian people inhabited the villages of Hochelaga and Stadacona in the St. Lawrence valley. These two peoples disappeared, however, some time in the 16th century. The Wendat, themselves, may have spoken more than one language or simply different dialects of the same language. The first inhabitants of Wendake, the Attignawantan and Attigneenongnahac, spoke a common dialect. The Tahontaenrat and Arendarhonnon, however, seem to have spoken different languages or dialects. In the case of the Arendarhonnon, the difference was sufficient to discourage Jesuit activity for a time. Iroquoian peoples shared more than related languages. Many cultural characteristics such as matrilineal societies and democratic systems of governance were common to most Iroquoian nations. With the possible exception of the Stadaconans near present day Quebec City, all were agrarian peoples. When Samuel de Champlain arrived in Wendake in 1615, he was keen to get a sense of the size and influence of the Wendat. Champlain eventually developed a fur trading network that used the Wendat as middlemen between New France and the Algonkian nations of the Canadian Shield. The agrarian Wendat were far more numerous than the Algonkian peoples who lived around Quebec City and in the northern parts of present day Ontario and Quebec. Furthermore, they lived in villages, in contrast to the nomadic Algonkians. The Wendat told Champlain that the population of their homeland was 30,000 people in nineteen villages. Historians and demographers have continued to debate this statistic. Some scholars have calculated populations based on the average size of longhouses, estimated decline from established census figures and other factors. The results of the various studies have given us a range of estimates at contact of 16,000 to 50,000. The Wendat were actually a confederation of four nations or tribal groupings. The largest group by far was the Attignawantan living between Georgian Bay and the Wye River. The Bear people, as they are often called, made up perhaps half of the population of Wendake and dominated the confederation. The Attigneenongnahac, the second largest group, lived along a ridge between the Sturgeon and Coldwater Rivers. 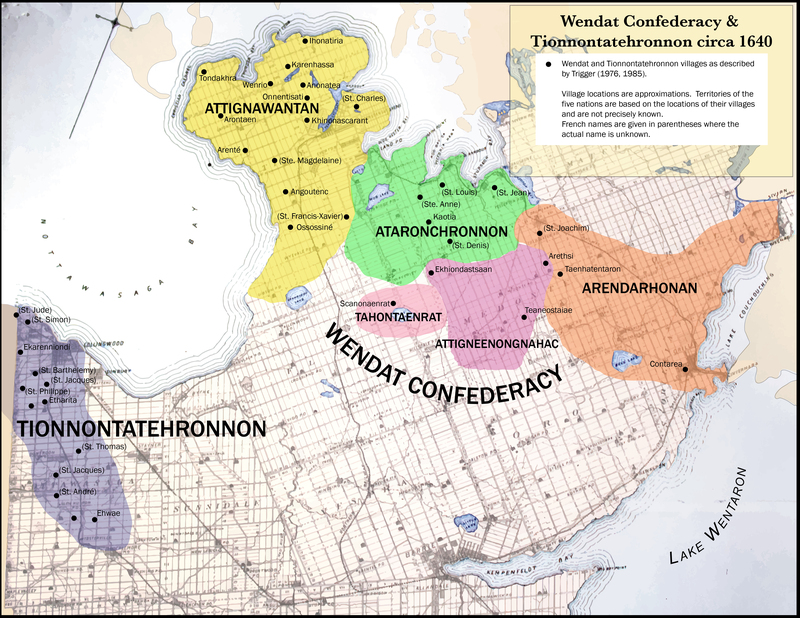 The Wendat Confederacy took its final shape shortly after the arrival of the Europeans. Two nations joined the Attignawantan and Attigneenongnahac from other parts of southern Ontario. The Arendarhonnon were the easternmost nation of the confederacy. They lived on the shores of Lake Couchiching and extended west to the Coldwater River. The last nation to join the confederacy was the Tahontaenrat. The smallest of the Wendat nations, they occupied one large village near Orr Lake, southeast of the Attignawantan. A fifth group formed some time around 1640. The Ataronchronnon were a nebulous combination that seemed to have coalesced from splinter groups of the established nations (with the Attignawantan almost certainly dominant). At least part of their number may also have been made up of refugees from neighbouring nations, such as the Wenro. They did not have nation status within the confederation. The Wendat were semi-sedentary; that is, they were an agricultural people who lived in villages. Due to the nature of their agriculture, however, they were obliged to move these villages every 10 to 15 years. Without the benefit of crop rotation and natural fertilizers, such as manure, the fields became exhausted of nutrients and yields began to diminish. The supply of wood surrounding the village was used up and villagers had to go further afield for this vital resource. The solution of the Wendat and neighbouring groups, such as the Tionontatehronnon and Haudenosaunee, was to move their villages to new locations nearby and begin again. The main crops of the Wendat were corn, beans and squash – commonly known as the “three sisters”. These crops were sown on raised mounds. The mounds helped protect the seedlings from late frost. The sturdy corn stocks provided a conduit for the beans to climb and the large leaves of the squash shaded the mound, keeping the roots of the beans cool in mid-summer and deterring weeds. Tobacco was another important crop, though the best leaves for smoking seem to have come through trade with the Tionontatehronnon on Georgian Bay. Though the products of their fields provided up to 85% of their nutritional requirements, the Wendat also relied on fishing and hunting for sustenance. Wendake was blessed with many lakes and rivers on which to fish. Fishing weirs were constructed on rivers to catch spawning fish. At the Narrows between Lakes Simcoe and Couchiching large weirs were built, the remnants of which can still be seen today. The Wendat adhered to a strict division of labour. Although men would clear fields for agriculture, the actual tending of the crops was the job of women and children. Men spent much of the year fishing, hunting, engaging in war and trading. The Wendat hunting grounds stretched south to the shores of Lake Ontario and east down the Trent River valley. 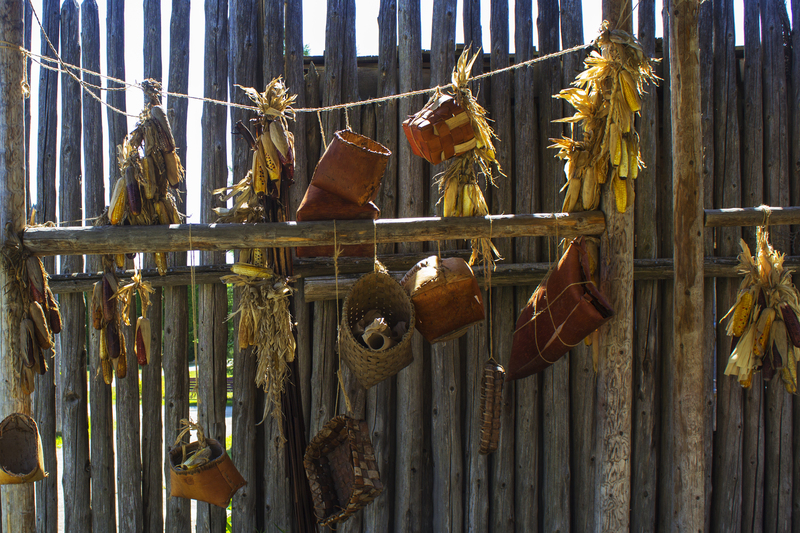 Wendat cuisine was heavily dependent on maize or “Indian corn”. The kernels were pounded and ground into a coarse powder that was mixed into soup and baked into bread. Cornmeal could be stored for a long time, thus providing food for the long winters of central Ontario. When other food supplies failed, cornmeal was usually on hand to see the villagers through until alternative supplies revived. The Wendat and other farming peoples were less prone to famine than the hunter-gather ers of the Canadian Shield though famine was not unknown among Iroquoian people. Enough maize was usually available for the Wendat to trade with their neighbours, the Odawa and Nippissing to the north and the Algonkins to the east. Trade was carried out over vast distances of the continent before the arrival of the Europeans. Native copper came from north of Lake Superior, shells from the Gulf of Mexico and Atlantic coast, tobacco came from the Tionontatehronnon and Neutral and pelts, unavailable or scarce in Wendake, came from the Shield country. Trade and military alliance seem to have gone hand in hand. The Algonkin of the Ottawa valley and the Susquehannock on the Susquehanna River in modern day Pennsylvania were both enemies of the Five Nations. Trade links with the Algonkin and Susquehannock were strong and concerted military action against the Haudenosaunee was occasionally attempted. The Neutral villages around the western end of Lake Ontario were another source of trade. 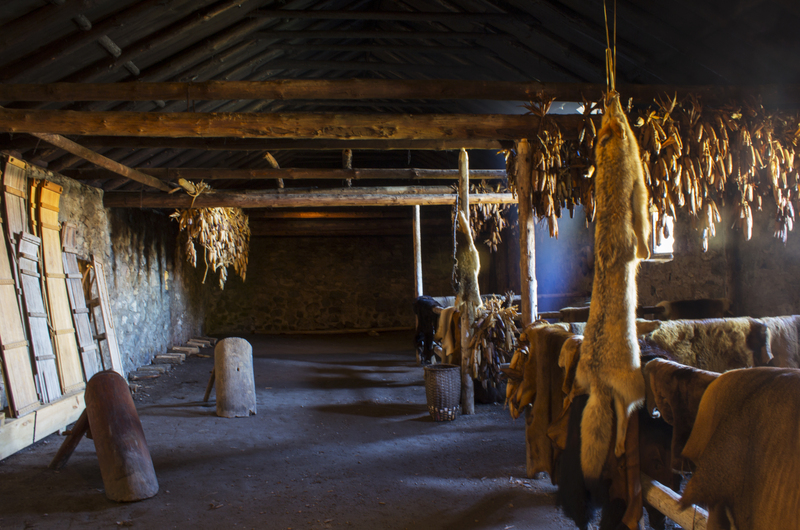 The Neutral provided tobacco and goods from further south, often serving as middlemen between the Wendat and Susquehannock. As their name suggests, they avoided taking sides in the Wendat – Haudenosaunee conflict. The Tionontatehronnon residing just to the west of Wendake were close relatives of the Wendat and provided most of their tobacco. Despite their proximity and similar culture, the two nations were bitter enemies not long before the arrival of Champlain in 1615. By the time the French arrived in the area, however, the two peoples were trading partners and may have had a military alliance of some sort. Wendat society was extremely egalitarian. Like many other First Nations societies, the individual enjoyed a great deal of autonomy. A position of authority was based on one’s personal qualities and reputation. A man who showed great courage in battle, skill in the hunt, rhetorical ability or generosity to those around him could aspire to leadership of a group or community. Respect for the individual rather than threat of punishment gave a leader his authority. Despite this great freedom for the individual, there were checks on behaviour in Wendat society. Social pressure, particularly of one’s extended family, those with whom one shared a longhouse, prevented slothfulness. Murder and violence against others in the community were usually dealt with by the families involved. The offended family could seek revenge upon the individual or family responsible for the crime but more often the offended party was appeased with gifts..
Young children in Wendat society were given a great deal of freedom. Parents and other adults were, according to the Jesuits, very tolerant of boisterous behaviour. According to the Jesuits, male children received very little direction until they reached puberty, whereupon they were taught to hunt and fight. In preparation for their future responsibilities, however, they spent much of their time playing with bows and arrows and other weapons. Female children grew up at the sides of their mothers and other women in their families. They tended to assist in the fields, preparing meals and other tasks appropriate to a woman in Wendat society. Like most Iroquoian societies, the Wendat were matrilineal. Lineage was traced on the mother’s side of the family. Whereas most Europeans traced their lineage on the father’s side and possessions would be passed down from father to son, the Wendat would expect to inherit the possessions of their mother’s brothers. 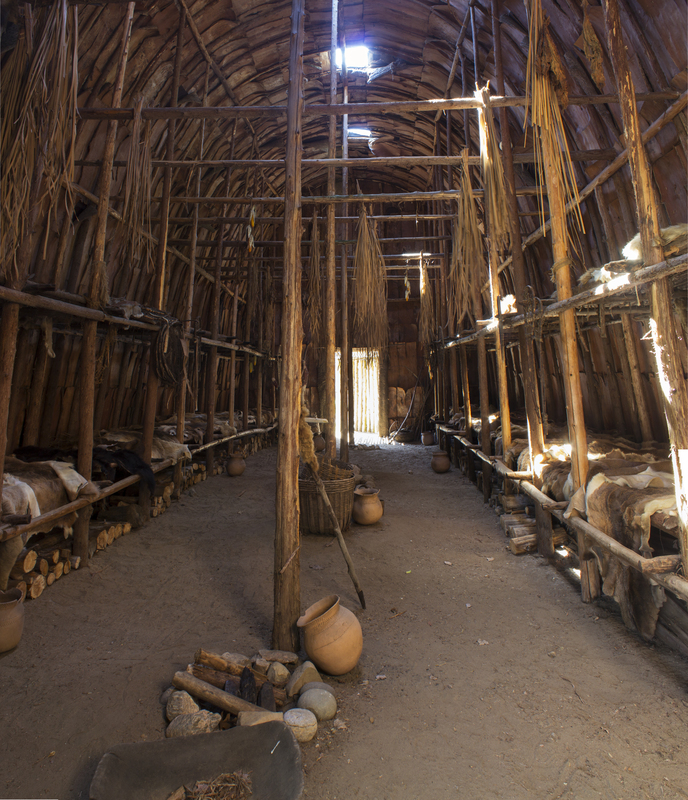 The longhouses were usually populated by the families of a number of sisters and/or daughters. Upon marriage, a man would normally move into the house of his wife’s parents. The women under a matriarch usually oversaw the affairs of the longhouse. Wendat society was divided into clans. The clan system, like the matrilineal nature of Wendat society was not well understood by European observers. Our present knowledge of this social structure is, as a result, somewhat foggy. There appear to have been eight clans (turtle, wolf, bear, beaver, deer, hawk, porcupine and snake). These clans represent historic maternal lines of descent. Other members of the same clan were considered relatives no matter how distant the link. Furthermore, it was forbidden to marry anyone of the same clan. The clan had a further role as a political unit. Clan members elected a civil and war chief to represent them on the village council. The role of chief could be inherited but rather than passing title from father to son, power would devolve to a nephew on a sister’s side of the family. Such a devolution was dependent, however, on one’s qualities and abilities. The system was based on merit unlike the European system of primogenitor. Civil chiefs of the various villages met frequently. Anyone present could speak, though speakers generally employed a highly stylized rhetoric with the goal of persuading others. Councils attempted to reach consensus in any decision. If an individual or representative of a clan segment did not agree with a decision he was not bound by it. Coercive powers did not exist at any level of government in Wendake. Tribal councils brought all the chiefs from the various villages together. These councils were only convened as needed. Any chief could call such a council if he considered a problem to involve surrounding villages. The Confederacy Council usually met on an annual basis and its powers were few. The basic purpose of this level of government was to reaffirm the alliance of the tribal units.